Please read two online accounts, one in the New Yorker and the other posted on the excellent blog Mondoweiss, about a recent incident at the Gagosian Gallery in New York. Just wearing a T-shirt can provoke the thought police into action, especially if anyone gets the idea that Israeli actions are being questioned. Julian Assange: Did he or didn't he? I'm linking without comment to the most detailed and interesting article I have seen yet on the sexual misconduct allegations against the WikiLeaks founder, in the Sydney Morning Herald. Whatever the truth turns out to be, you can bet the American, British and Swedish governments are talking nonstop about how to get Assange extradited to the United States. The coverage of the sexual allegations in the U.S. press has been pretty poor as far as I can see, leaving the field mostly to the imagination of wild-eyed bloggers, some of whom are trying to connect accuser Anna Ardin with right-wing anti-Castro groups. I will be based in Sydney for a month beginning in just a matter of days, so I look forward to more stories in the Australian press, which seems to be a little ahead of the game if this article is any indication. PS--I'd be grateful to readers for links to any other interesting stories they see. Afterthought: A lot of commentators have criticized WikiLeaks for releasing some documents with the names of Afghans who have been cooperating with the U.S. government. But a story in the New York Times about the unsavory character of one such informer (a drug lord) makes me wonder if Americans are not entitled to know exactly who we are dealing with? Especially as we are sending our young men and women to die in Afghanistan? And dying they are. Update (or downdate): Another perspective on the accusations against Assange can be found here. What will the Obama Justice Department do now that the Senate has pretty much killed repeal of "Don't Ask, Don't Tell"? Will it continue to defend the law in the courts--using the lame excuse that it is obligated to do so--or embrace a federal court ruling that it is discriminatory and unconstitutional? To put it another way: Is the Obama administration's position that bigotry against gays is okay if Congress approves it, but not okay if our legislators vote against it? Is bigotry against gays a civil rights issue or not? Few today would argue that Congress has the right to decide whether African-Americans or other groups have the right to vote, attend integrated schools, etc. But the Obama administration is taking that position when it comes to gay rights. And for that, it deserves all the contempt it is receiving from those who know better. Another mine explosion: Will the mainstream media get it right this time? News is breaking today that 27 miners are missing after an explosion in a New Zealand mine. After all the hoopla over the Chilean miners, in which mine safety issues were rarely mentioned in news media accounts over the long months, journalists have another chance to get this story right. If you don't like the verdict, move to another "court"? In his story in today's New York Times about the acquittal of Ahmed Khalfan Ghailani on all but one of 285 charges related to the 1998 embassy bombings in Kenya and Tanzania, reporter Benjamin Weiser states that "the result seems certain to fuel debate about whether civilian courts are appropriate for trying terrorists." Could I pull out my editor's red pencil and change that to "the result seems certain to fuel debate about whether civilian courts are appropriate for trying [alleged] terrorists [who have been subject to torture during their interrogations]." Ghailani may well have played an important role in the bombings, as prosecutors claim, and he will probably stay in jail for a long time for the one charge he was convicted of. But just because we don't like the verdict doesn't mean we can keep changing the rules of the game until we get an outcome we like. Nevertheless, the Times is hosting a debate on the subject, and the Obama administration will have one more excuse to continue acting just like the Bush administration when it comes to lowering legal standards for convicting terrorist suspects. Update: Morris Davis, former chief prosecutor for the military commissions at Guantanamo, takes a similar position in a Times op-ed, arguing that a military commission judge probably would have suppressed the same witness evidence that the civilian judge did in this case. While I don't like arguments that are based on pragmatism rather than principle, Davis argues that the two go hand in hand, and most importantly that critics of civilian trials are flat wrong on both counts. Nazis were given safe haven in the U.S. The idea of compiling the report was the "brainchild" of the late Justice Department lawyer Mark Richard, Lichtblau reports. Richard urged that it be made public but died last year while the fight to get it released was still going on. If you read between the lines of the article, you might even be able to make some guesses about who leaked it. Is debate about its history now taboo in Israel? The photo at right is of Lisa Strombom, a PhD student at Lund University in Sweden. She has just completed and defended (yesterday) a thesis about the effective suppression in Israel of discussion about the nation's history, especially the oppression and exiling of Palestinians that accompanied its birth in 1948. The following is from the Lund University press release about her thesis, which makes interesting reading on its own. You can access the entire text of the thesis here and at the link given below. Understanding the enemy’s view of history is important if there is ever to be peace in the Middle East. Unfortunately it has become almost taboo to create understanding for the opposite side in today’s Israel. This is the view of Lisa Strömbom, who defends her thesis in political science at Lund University on 12 November. Lisa Strömbom has studied the history debate that took place in Israel during the 1990s when the peace process between the Israelis and the Palestinians looked promising. The Oslo Accords in 1993 were the closest they had come to a peace settlement since the state of Israel was founded in 1948. During the same period, Israeli historians began to view the country’s birth with somewhat new eyes – the war that preceded the creation of the state was not as unblemished as had previously been claimed: it was not the case that the Jews began building their country in a fairly uninhabited region and that the Palestinians who lived there left the country on their own initiative or that of their elite. “The history debate was not lacking in controversy, but it did exist and was very animated”, says Lisa Strömbom. In 1995 Israeli Prime Minister Yitzhak Rabin was murdered and the Oslo Process stagnated. Since then, and in particular since the outbreak of the second intifada in 2001, the history debate in the Israeli media has ceased. Textbooks that take up the Palestinian perspective on history have been revised or removed from classrooms. History teaching has also been complemented by a new subject, ‘heritage’, which gives a more ideological picture of Israel’s history. As an example of how Israeli society has changed, Lisa Strömbom mentions the hundreds of thousands of Israelis who turned out en masse to demonstrate against the Lebanon War in 1982. Unlike previous wars, they considered that it could have been avoided and that the Israeli military had used excessive force. In the Gaza War, when, according to subsequent reports, there were a lot of attacks on the Palestinian population, large sections of Israeli civil society remained passive, which can partly be explained by strong campaigns of delegitimisation against all those who opposed the current government’s policies in different ways. Young Jews Disrupt Netanyahu at Jewish General Assembly from stefanie fox on Vimeo. I'm sure that some critics will try to brand the heroic activists who carried out this widely covered action as "self-hating Jews." Indeed, Netanyahu implied that in his response to them. As one who applauds such actions, and as a new member of Jewish Voice for Peace, my response is that we Jews who oppose Israeli policies--especially the theft and occupation of Palestinian lands--don't hate ourselves. Rather, we detest those Jewish leaders who have betrayed Judaic values of tolerance and social justice by using the Holocaust as an excuse for the oppression of other peoples. PS--Due to a heavy teaching and writing schedule in New York this fall, this blog has been largely dormant. I am hoping that will change in the weeks and months ahead. Update: A detailed explanation of this action, by Rae Abileah of CODEPINK and Jewish Voice for Peace, can be found here; and one of these brave activists explains, in the face of criticism, why he participated in it. More update: Another of the five young Jewish protestors against Netanyahu and his policies, Matthew Taylor, explains his views in an op-ed in Haaretz. This blog is supposed to be about many things, including jazz, but I've been so busy lately I didn't even blog about going to see the sensational Anat Cohen at the Village Vanguard last month. But I hope to make amends by posting this rare clip of Stan Getz and John Coltrane playing together, something that apparently only surfaced very recently. New York is a city that soaks up all your energies and then gives them back to you hypercharged, so I'm hoping to get this blog back in gear very soon--at least on a weekly basis. Regular readers of this blog will know which one of these events I attended, but just in case I submit this photographic evidence. I'm not much of a photographer and even my spiffy new Lumix with a great wide-angle lens didn't allow me to capture the size of this demonstration, which had a pretty good turnout. The police, cited by the New York Times, estimated 2000 anti-racists, and slightly more bigots. I don't much like demonstrations where only leftists show up, preferring broader coalitions. So perhaps more heartening was an event that took place the evening before, which I did not attend, a candlelight vigil also at Park Place. The Indypendent has a good account of it here with lots of links to the organizations involved. Of course, it still seems up in the air whether the cultural center will be built on Park Place or whether it will end up being moved elsewhere. My sense, as a part-time New Yorker just newly arrived in town, is that the project will probably go ahead as long as Mayor Michael Bloomberg sticks to his so-far very principled stand against bigotry. It's a sad day when the best position on an issue comes from a political conservative (I'm referring of course to the flock of cowardly Democrats who have come out against locating the center near Ground Zero), but we have to take our favors where we find them. The August 19 New York Review of Books features an important letter from former intelligence officer Fulton Armstrong about how the Bush administration put pressure on the intelligence community to come up with evidence that Iraq had "weapons of mass destruction" as a justification for invading Iraq. It is critical reading for anyone who wants evidence to counter the claim that this judgement represented the best intelligence estimate available. The text of the letter follows; Thomas Powers replies below it. The following letter, by a former USintelligence officer, was sent in response to Thomas Powers’s review of Robert Jervis’s Why Intelligence Fails: Lessons from the Iranian Revolution and the Iraq War in the May 27 issue. Mr. Jervis’s exoneration of the Bush administration for cooking the intelligence on Iraq’s nonexistent WMDs—by blaming the intelligence community alone for the failure—is understandable. Jervis wasn’t in the kitchen and, perhaps, doesn’t know the pressure analysts feel when a vice-president and cabinet members ask the same question over and over—signaling “try again, try again.” Nor, perhaps, does he know the power of an administration’s flattery. I was a member of the National Intelligence Council (NIC), as national intelligence officer (NIO) for Latin America, from 2000 to 2004. The NIC is the intelligence community’s senior analytical group responsible for preparing National Intelligence Estimates (NIEs), including the Iraq WMD NIE. At the time, it reported to the director of the CIA, George Tenet, in his “intelligence community hat” and was located at CIA headquarters. Although the NIC is an interagency body, the CIAhas always dominated its staff and work. The first congressional briefing I ever took part in as an NIO, along with my colleagues, included discussion of WMDs, and it started with fifteen minutes of paeans of praise by Jesse Helms, and other Republicans on the Senate Foreign Relations Committee, for our intelligence work. Several of the NIOs were praised for having embraced the findings of the Rumsfeld Commission, which pressed upon the Clinton administration a hyped analysis of the missile threat (and rationale for an accelerated “missile defense strategy”). The NIOs clearly knew what was going on in that room. Intelligence officers are all trained to remind the recipients of their reports that they are never to take sides in a policy debate. These NIOs, however, said nothing and were clearly happy with the praise by the Republican committee members. The National Intelligence Estimate produced by these NIOs on weapons of mass destruction in Iraq, with the participation of the CIA and other intelligence agencies, was not subjected to the customary “peer review” of the National Intelligence Council because, after delaying the project for months, the NIOs didn’t have a spare hour for the discussion and debate that the council’s review would have provided. But we knew what they were up to. During our closed-door council meetings, they would eagerly report their progress in dividing the fifteen coordinating agencies that had contributed to the NIE. They boasted how, after an obviously extensive search, they finally found an Energy Department employee willing to contradict his agency’s consensus position that Iraq’s missile tubes were not, as the administration and the NIOs asserted, centrifuge tubes. The NIOs who were preparing the NIE also boasted how they found an Air Force analyst to dissent from his service’s position that Iraq’s little unmanned surveillance planes could not be armed. They were happy that challenges to their and the administration’s assumptions about Iraq’s chemical weapons and biological weapons capabilities were minimal; after all, who’s going to try to prove a negative? The most back-patting, however, was reserved for their success in forcing the State Department’s intelligence shop, the Bureau of Intelligence and Research (INR), to take a “footnote”—a dissent at the bottom of the page—on a lesser judgment in the paper rather than on the overarching judgment that Saddam Hussein had WMDs. One of the NIOs smiled when he reported that INR couldn’t prove that Saddam did not have WMDs and that no one wanted to be seen as defending Saddam anyway. That was exactly the Bush administration’s political strategy as well. Instead of allowing INR to develop an alternative analysis in the main text of the NIE—the proper form for a different view when the information is so obviously weak—the NIOs humiliated the only agency at the table, the State Department’s INR, that dared to question the administration’s preordained conclusions. When we on the National Intelligence Council finally got a full read of the National Intelligence Estimate on WMDs, after its publication, a couple of us expressed grave reservations about the fatally weak evidence and the obsessively one-sided interpretation of what shreds of information it contained. (We were not told at the time that “Curveball” was a solitary source of obviously questionable credentials, nor that contradictory evidence was actually suppressed from the intelligence collection and dissemination process.) One colleague said it was clearly a paper written to provide a rationale for a predetermined policy decision to go to war. When I challenged the lack of evidence and the lack of alternative explanations, including forcing the questions raised by the INR into a lowly footnote, one of theWMD-promoting NIOs leaned forward and bellowed: “Who are you to question this paper? Even The Washington Post and The New York Times agree with us.” The irony was complete: previously respected reporters, spoon-fed by Bush administration officials, were now being used to provide cover for the NIOs’ similar compromise in accepting the administration’s view. The National Intelligence Council and director of central intelligence, George Tenet, gave the NIOs concerned with WMDs big cash awards for producing theNIE, and seven years later and seventeen months into the Obama administration they remain in the same or equivalent jobs. The Bush administration left office, and its defenders still claim that the errors in the WMD debacle were innocent, just as the hyperventilation about “yellowcake” from Niger in a State of the Union address—cleared by a careerist in a CIA line office who worked closely with the administration and the NIC on WMD issues—was said to be innocent. Intelligence community spokesmen are rolled out to deny allegations of politicization, even though at least one of them, a former analyst who threatened to resign several times because of political pressures when he was working on Cuba, has witnessed it close up and paid a short-term career price for resisting it. Covering up or ignoring the problem of politicization won’t make it go away. USintelligence will continue to fail again and again until we resolve it. Fulton Armstrong’s important letter states as fact something Americans have been resisting for sixty years—that presidents tell the CIA not only what to do, but what to say. By Americans I do not mean only ordinary citizens puzzling over intelligence flaps every few years, but observers thought to be sophisticated, like professors, senators of long experience, foreign policy professionals, and reporters for serious newspapers. Armstrong describes the reality about as plainly as I have ever seen it done in his letter explaining the source of error in the CIA’s insistently wrong estimate of the progress of Saddam Hussein’s Iraq in its purported effort to develop weapons of mass destruction. Armstrong’s letter is in reply to the many-layered, nuanced, and above all forgiving analysis of that error by Robert Jervis, a professor of international politics at Columbia University. Jervis’s case was made initially in a new book,Why Intelligence Fails, and then clarified in a letter to The New York Review, responding to my review of his book. In the beginning, Jervis says, he guessed that the agency’s misreading was probably the result of pressure from the White House to pump up the Iraqi “threat” as a way of justifying war. But Jervis found no intelligence insider who would flatly tell him that was what happened. Later, he identified so many interesting complexities in the evidence that he was compelled to dismiss White House pressure as too simple an answer, leading him to conclude in the end that the error was honest. It goes without saying that this was the answer the White House and the CIA had both been maintaining all along—we did our best, nobody’s perfect, everybody made the same mistake. We might call this the aw-shucks, gosh-darn explanation of weirdly wrong intelligence estimates. Armstrong is having none of it. With polite good humor he forgives Jervis for making a naive mistake typical of outsiders but puts first things first—not the limitations of evidence but the naked fact of unambiguous White House intent. When a vice-president visits the CIA eight times to express his views, as Cheney did in the run-up to the Iraq war, he’s not struggling with the higher geometry of intelligence analysis but turning up the heat in the kitchen. Cheney knew it and the agency analysts knew it. This is fundamental. If you can’t get this right you can’t get anything right. Armstrong deals with the point in a sentence but it ought to be emphasized that a great deal more than a sentence supports this interpretation of what was going on. The literature on the history of the origins of the Iraq war is filled with instances of White House and Defense Department efforts to press their views on analysts, and in each instance the motive is the same—policymakers know what they want, and they are making sure the CIA knows what they want, and they are not going to let it alone until they get what they want. 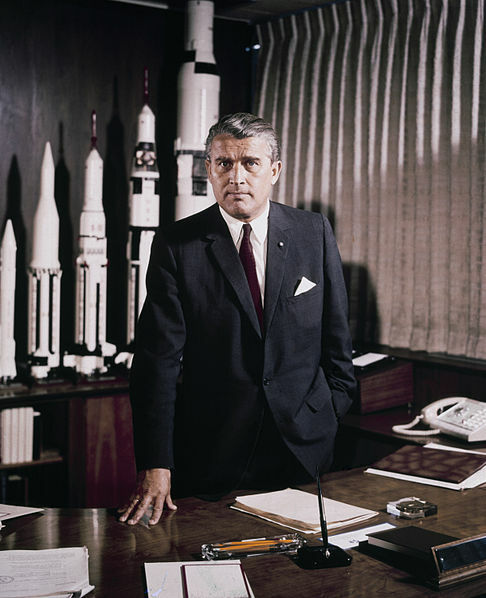 As a former official of the CIA, Armstrong was required to submit his letter to the agency for clearance before publication, which was done. What Armstrong can say in this instance is thus limited to the text of his letter, as cleared. But other sources easily found on the Web make it clear that he has had an active career. Some years back he was identified during a Senate hearing as a CIA officer specializing in Latin America; more recently he has been identified in the press as a staff member of a Senate committee. He is fluent in both Spanish and Chinese, and worked for several years in Taiwan. Beginning in 2000 Armstrong was the CIA’s national intelligence officer (NIO) for Latin America, and as such was a member of the National Intelligence Council (NIC), which writes official intelligence estimates, a process frequently more protracted, contentious, and laborious than might be suggested by the simple word “writes.” But it ought to be remembered here that the special 2002 NIE on Iraqi WMDs was hastily written at the last minute when President Bush was pressing Congress for authority to go to war. Under usual circumstances Armstrong and other members of the NIC would have debated every detail of the estimate, a process sure to have highlighted the thinness and the fragility of the evidence, such as it was. In 2002, so far as we know, theNIC had no opportunity to weigh in on the final language before the estimate was published. But Armstrong and other members of the NIC caught the drift easily enough, as he makes evident. It is not the details of the arguments over WMDs that explain what was happening but the tone of the office chatter as the various NIOs cobbled the estimate together. They were unmistakably delighted with their success in finding someone—indeed, anyone—to back scary claims that Saddam’s Iraq was building unmanned aerial vehicles that could deliver chemical and biological agents, and that aluminum tubes purchased by Iraq were intended for use in centrifuges to separate fissionable uranium. Self-congratulation reached its apex when they convinced the State Department’s Bureau of Intelligence and Research (INR) to limit its doubts about Iraqi WMDs to a “footnote,” rather than insisting on incorporating a substantive dissent into the text of the estimate. Armstrong was present in the NIC office; he heard the NIOs on weapons matters crowing about their success; he knew they were hammering out the estimate they needed to help the White House justify war. On paper the National Intelligence Council is a company of equals, including the different intelligence agencies of the US goverment; in reality in 2002 it was run by the CIA, and its paper was signed by the agency’s director, George Tenet, who worked directly for the President. The estimate Tenet signed was tortured in argument and thinly supported by evidence, but it was just what the doctor ordered—an ominous piece of paper that few members of Congress were prepared to question. Armstrong’s letter is only the most recent evidence that what went into the estimate was not left to chance. The world of intelligence analysis is arcane, with its own vocabulary, body language, pecking order, and secret history. Few outside that world can readily understand what was signaled by the INR’s agreement to accept a footnote, but all involved in the process knew that the State Department analysts had been given their marching orders, and backed out of the room in misery with heads hanging low. Who had the authority to tell them to cave? Armstrong does not pursue this awkward point, but there can be only one answer—it was the man who laid out the intelligence case before the UN a few months later, the secretary of state, Colin Powell. Was Powell second-guessing his experts, or bowing to higher authority? And what about the higher authority? What is the proper response to a president who has conspired to launch an unjustified and therefore illegal war against another country? The more clearly the matter is stated, the more troubling are its implications. It is my guess that Armstrong must have thought long about the American way of doing intelligence, but his letter halts with “the problem of politicization.” Tenet, like other CIA directors, always insisted that the agency “calls them as they see them”—a formulation that suggests it is the agency’s duty to resist pressure, and that the agency is to blame when it caves. But this way of putting the matter ignores the power of presidents. Why are sophisticated observers—Robert Jervis is a good example, but far from alone—so reluctant to reach the obvious conclusion, that presidents who know what they want will turn up the heat until they get what they want? Simple realism suggests the answer. Somebody got the Iraqi WMDs equation completely wrong and plunged the United States into a seven-year war, not over yet. But who shall we blame—intelligence analysts or the President? Consider the fighting weight of the two candidates: on the one hand is the bundle of organizations referred to as “the intelligence community”—many thousands of anonymous civil servants barred by law from telling what they know, and who, if fired, may have nowhere to take their skills. On the other hand is the president, champion and hero of roughly half the American population, given the benefit of the doubt by nearly all, backed by a national political party, with the immense publicity-generating apparatus of the White House under his immediate control. The one is usually innocent but defenseless. The other is deeply culpable but dangerous to challenge. How dangerous? Reflect on Watergate for a moment. It is no longer a secret how the Bush White House pushed, cajoled, bullied, and deceived the United States into war with Iraq. But which leading national figure is pressing for a national commission with power of subpoena to dig out the facts and establish what happened and why? None that I can see. It’s easier and safer to conclude that the anonymous analysts just got it wrong. More on that "Ground Zero Mosque"
9/11 was carried out by an organization called Al-Qaeda. It claimed to be acting in the name of Islam, but it wasn’t. Likewise, the KKK claimed to be acting in the name of Jesus Christ when it burnt crosses and lynched Black people, but it wasn’t either, and we don’t blame Christians or Christianity itself for those actions. What does the Islamic cultural center have to do with 9/11? Nothing whatsoever, unless you want to blame Islam and all Muslims for it. 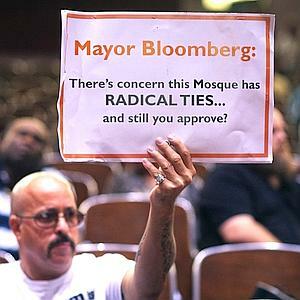 As Bloomberg said, how big should the no-mosque zone be? How far would a mosque have to be from Ground Zero before it was not tasteless or idiotic? 4 blocks? 6 blocks? 10? All of downtown? All of Manhattan? No one said a peep about the center for months, and then some conservative bloggers made a deal out of it, and right-wing and racist politicians seized on it as a wedge issue for the upcoming elections. Unfortunately, some “reasonable people” have been suckered into falling into their trap and helping them do their work. Meanwhile, a lot of other Americans are remembering our core values of religious freedom and tolerance and pointing out that Constitutional rights only have meaning if they are allowed to be expressed without intimidation. Nazism was a racist movement in which a small fringe sucked in a lot of “reasonable people,” indeed pretty much a whole nation. It was also a movement that scapegoated an entire religious and ethnic group for the perceived sins of a few of its members. It’s just a matter of degree. This is the caption on one of the signs (see photo at right) held at a protest against the "Ground Zero Mosque" yesterday, August 22. So this is how we set our standards of tolerance in the United States, according to those of religious fundamentalists? Boy, does this country ever need to go back to school for a civics lesson. By the way, as Frank Rich pointed out yesterday in the New York Times, it's not a mosque, it's an Islamic cultural center with a prayer room. But I'm sure that doesn't make much difference to the bigots who attend these protests. Anyway, I will be in New York for several months beginning August 31, and I am sure there will be plenty of demonstrations in favor of this building project for me to attend. Hope to see some of you there. But every once in a while someone expresses what many of us are feeling and thinking in such a clear and powerful way that we wish we had done it ourselves. Those people are called, um, writers! And in his blog today, my friend and close comrade-in-arms Marc Cooper, a journalism professor at the University of Southern Calfornia, surpasses his usual eloquence. Please read it at this link. Oh, and please forgive Marc for the rather disgusting image he chose to illustrate his post, although it is probably well deserved in this case. Most repulsive to me, as a nominal Jew, has been the unspeakable but rather predictable posture of the Anti-Defamation League. I say predictable because the ADL has been running one of the greatest of scams for way too long, baldly capitalizing on the Holocaust while serving, primarily, as a lobby for the state of Israel. Anti-semitism is charge no one wants to bear, and the ADL has cynically manipulated the issue and politcally blackmailed (and blackballed) way too many legitimate critics of Israel by smearing them as anti-Semites (yours truly included). The revenge of the bulls. I hate to see anyone get hurt, especially children, but it's hard to feel entirely sorry for the spectators injured by a taunted bull run amok in Spain. At least the people of Catalonia have had the good sense to ban bullfighting. The bull always loses in the end, but sometimes takes people down with him along the way--bullfight enthusiasts should at least be able to appreciate the poetic justice when that happens. Israel reaches new peak in arbitrary razing of Palestinian homes. So says Human Rights Watch. "While Israel is demolishing more and more Palestinian homes, it continues to subsidize the Jewish settlements nearby," said Sarah Leah Whitson, Middle East director at Human Rights Watch. "Israel has flouted international law not only by supporting settlements on occupied territory, but also by erasing longstanding Palestinian communities next door." Generous gesture or guilty conscience? 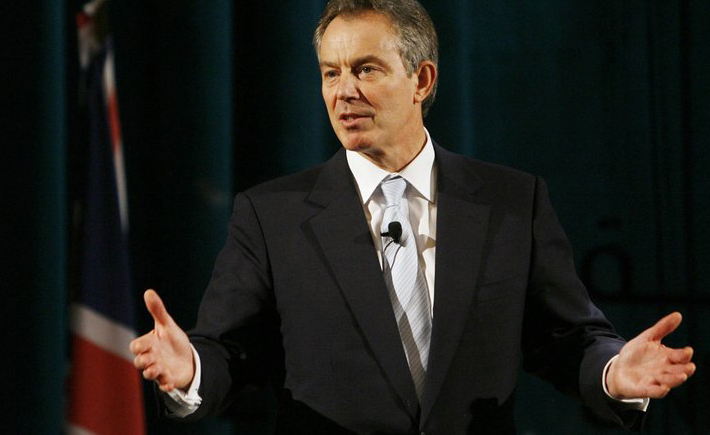 A big debate has broken out in the UK over Tony Blair's announcement that he will donate the entire proceeds from publication of his memoir (which includes an advance reported to be over £4 million) to the Royal British Legion. The money will reportedly go to pay for a new rehabilitation center for the soldiers injured in the Iraq war he helped propagandize and carry out. The question being debated is whether this should be considered a generous gesture or a sign of a guilty conscience. It seems to me that both are right, since it is often the case that two contradictory things are true at the same time. And a guilty conscience is better than no conscience at all. Can one imagine George W. Bush making a similar gesture with the profits from his own memoirs? Facebook photos of soldiers posing with bound Palestinians are the norm. So says the Israeli group Breaking the Silence, quoted in an article in Haaretz. "Defining Israel as a Jewish state condemns us to living in a racist state." So says Gideon Levy in a superb column in Haaretz. Please read it. Thanks again to the superb Mondoweiss blog for the heads up. 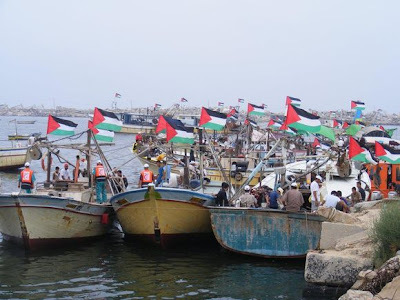 There is a lot of excitement building over this fall's planned wave of boats to Gaza, including one from New York organized by USTOGAZA. The sponsors of the American effort include a roster of leading progressives. Some of my personal favorites include Russell Banks, Phyllis Bennis, Henry and Kathleen Chalfant, Rachel Corrie's parents, Rashid Khalidi, Michael Ratner, Alice Walker, Blase Bonpane, Len Weinglass, and David Zirin. Just so you will know you are in good company if you decide to donate, which you can do on the home page. The momentum against Israeli brutality towards the Palestinians is building at a rate unimaginable even a year ago. I will be in New York this fall and plan to be there to see the boat off. I hope you will join me, at least in spirit and with your donations to this essential cause.